An amazing thing happened on the ward this evening, as I worked a late shift. The dimly lit corridor was brought to life, not by light, but with music that I instantly recognized and thought for a moment that someone had their television turned up to the highest notch, but I was wrong. Stepping out onto the ward, I listened to see where the music was coming from. It sent shivers up my spine. It was a song, sung in welsh and one that my father often sang to me when I was just a child. In that moment, I was that child again and longed to see my father standing there smiling back at me. But he had died a long time ago! So I followed the voice which had risen to a crescendo and had aroused the curiosity of some of the patients. The voice was coming from a room at the far end of the corridor and standing in front of the closed door, I was almost reluctant to knock and disrupt the music. It was incredible. 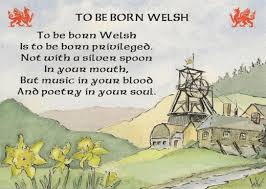 But I knocked and opened the door and watched in amazement, as a patient belted out the old welsh song ‘We’ll keep a welcome in the hillside’ his eyes shut fast and his fists flashing about as if conducting an orchestra. I waited for him to finish before giving an exaggerated cough and a genuine smile. This was returned, with the added apology which I said was not necessary. I closed the door gently behind me as I left the room and everyone was delighted when his voice echoed through the ward once again. He eventually slept and so, I guess did all the other patients, with their own memories of days gone by. We'll keep a welcome in the Vales. And with a love that never fails.